I spend a lot of time playing with coasters because they’re such an essential item at my house. With small children in residence, anything breakable is foolhardy, so I’ve made any number of crocheted circles to hold my coffee cup over the last couple of years. This is a basic design that is no less useful for being simple to make. Enjoy! 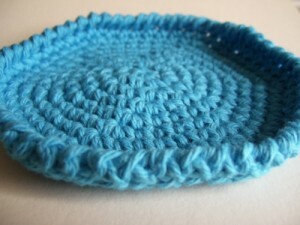 Materials: Approximately an ounce of worsted weight cotton for each coaster. A size G (4.0 mm) crochet hook. 1 stitch marker, if desired. Tapestry needle for weaving ends. This pattern is worked in a spiral. Do not join rounds. If you’d like, you can mark the beginning of each round with a stitch marker. Finished size: Approximately 4 inches (10 cm) in diameter. It can be made bigger or smaller by adjusting the number of rounds worked before the finishing two rounds. Round 1: Ch 2. 6 sc in 2nd chain from the hook: 6 sc. Do not join. Round 2: 2 sc in each sc around: 12 sc. Round 3: (2 sc in next sc, sc in next sc) around: 18 sc. Round 4: (2 sc in next sc, sc in next 2 sc) around: 24 sc. Round 5: (2 sc in next sc, sc in next 3 sc) around: 30 sc. Round 6: (2 sc in next sc, sc in next 4 sc) around: 36 sc. Round 7: (2 sc in next sc, sc in next 5 sc) around: 42 sc. Round 8: (2 sc in next sc, sc in next 6 sc) around: 48 sc. Round 9: (2 sc in next sc, sc in next 7 sc) around: 54 sc. Round 10: Sc in each sc around: 54 sc. Round 11: Rsc in each st around: 54 rsc. Fasten off. 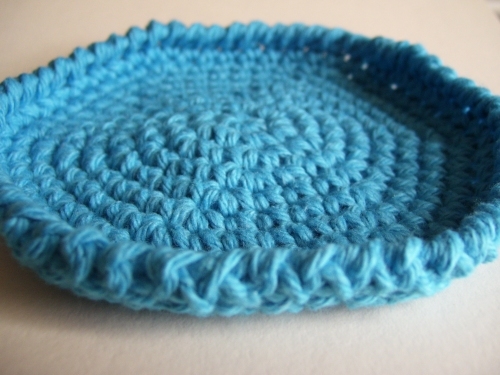 Weave in ends and enjoy your coaster! I pay a quick visit everyday some blogs and information sites to read articles, except this blog provides quality based writing. 21st anniversary at the iconic Michelin House.